Transfer to the Royal Class bus station. Night at hotel in Nazca. Night at Hotel in Paracas. Transfer to hotel or airport. Tourist Trip From Lima to Nazca This trip starts around Noon , so you will have free time in the morning to have walks around Lima at an agreed time our staff will pass by your Hotel to take to the Bus Station to Nazca, you will travel through the coast, in Nazca a local guide will be waiting to take you to the Choosen Hotel. Second day: On flight to the "Nazca Lines"
In the morning, having breakfast, we will transfer you to the Nazca airfield to start the adventure of flying over these fascinating figures, for 45 minutes you will enjoy this experience, from where you can see the giant figures of animals and plants, drawn by the pre-Inca cultures with an end not yet discovered, many believe that these figures were made by extraterrestrials, among which are the monkey, the spider, the hummingbird, etc. Then there will be a visit to the "Cementerio de Chauchillas". Then, you will go to the Nazca bus terminal to make your trip to the city of Paracas, where our staff will wait for you to drive you to your hotel where you will spend the night. (Photo: Spider of the Nazca Lines). Third day: Tour to the "Islas Ballestas" and "Reserva de Paracas"
After having our breakfast, we will move to the port of Paracas, where we will begin the tour to the Ballestas Islands passing through "El Candelabro" a giant image on the side of a hill, we will visit the different islands for two hours, observing the different species of sea lions, seals, penguins and guano birds. 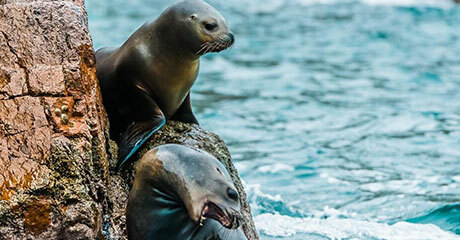 After arriving at the port we will make the tour to the Paracas reserve. In the afternoon we will go to the bus terminal of the city of "Paracas" to take their bus to the city of Lima. Upon arrival in Lima, we will wait for you at the bus terminal and transfer you to the airport or hotel. Farewell. (Photo: Ballestas Islands in Paracas).